It is impossible to be in Buka and not encounter travel by small boats! Small craft ply the Buka Passage on a regular basis and water taxis are a regular feature of life in the town. In order to get across to the mainland you must first take a water taxi across the passage to Kokopau at K2 fare each way and from there continue by road to Central and South Bougainville. Boat travel will often be by small 19-35 foot ‘banana boats’ (dinghies) with a 40hp or 60ph outboard motor. Buka Ring Road is the best and circles the island of Buka. Roads from Kokopau, to the main Bougainville Island including Tinputz, Arawa, Kieta, Panguna, Buin and Siwai is mostly by four wheel drive vehicles as many parts of Central and South Bougainville roads are still undergoing maintenance and upgrading. Most of the rivers that cross the road do not have bridges and can be impassable at times due to increase in currents and floods after torrential rainfall. It is advisable to check the status of the rivers before starting your journey around the mainland Bougainville. Hires cars are available in Buka, Kokopau, Arawa, Siwai and Buin. Your local tour operator or guesthouse should make necessary arrangements. Rate of daily hire within Buka varies from K500-K800 while in Arawa, Siwai and Buin between K1000-K2000 per day. 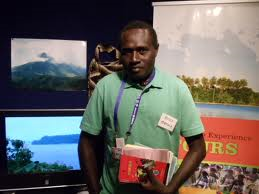 Kokopau , the extrance of Bougainville island, is where you find hire cars and PMV to Arawa, Siwai and Buin. There are courtesy or charged hotel bus transfers available in Hani’s Inn, Kuri Village Resort and Lumankoa Guesthouse to and from the airport. Please confirm when making reservations. Public Motor Vehicles (PMV) are available around Buka town and Kokopau. The current fare on a PMV to Arawa from Kokopau one way is K50 and further from Arawa to Siwai and Buin is another K50. Check our Telephone Directory for list of hire cars.